Govatsa Dwadashi, also known as Nandini Vrata, is observed on the 12th day of the Krishna Paksha of Ashwin month in North India, Gujarat, Maharashtra, Karnataka, Telangana and Andhra Pradesh. Govatsa Dwadashi 2019 date is October 25. The day is mainly dedicated to the worship of Cows – Divine cow Nandhini is worshipped on the day. 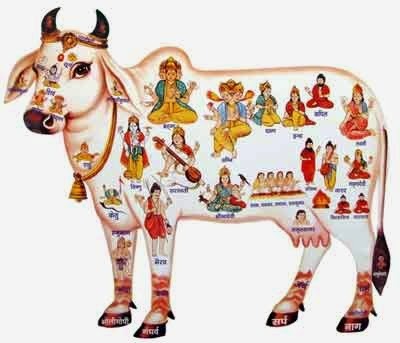 According to Bhavishya Purana, Govatsa Dwadashi is associated with the story of divine cow Nandhini and her calves. Hence this day is also referred to as Nandhini Vrata. The idols of cows and calves made of mud are worshipped on this day. Nandini is believed to fulfill the wishes of her devotees. On Govatsa Dwadashi day, images of Cow and Calf are made and are adorned with turmeric and kumkuma. Offerings such as sprouted moong and gram are made to cows who are representatives of Nandhini on earth. In some regions, it is strictly prohibited to drink cow milk, ghee and curd on this day. This day is also known as “Guru Dwadashi”. It is termed as “Vagh” in North India, where, “Vagh” refers to repaying one’s financial debts. Therefore, people clear their account books on this and they will not enter further transactions using new ledgers on this day. InMaharashtra, the day is popularly known as Vasubaras. It is also known as Govamsa Puja in some regions of North India. The main ritual on the day is offering puja to cow and calf as it symbolizes auspicious and prosperity. In some regions, Govatsa Dwadashi marks the beginning of Diwali celebrations.